4. Luminosity greatly improved thanks to newly developed LED integrated unit and reflection system. 5. LED used as light source ( red 15 units, Orange 15 units, green 30 units), ending problem of burned out bulbs. 6. 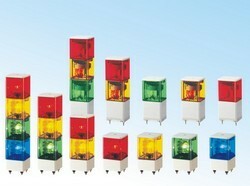 Various types of information can be displayed by using different colours controlled by several (1 to 3) external Signals. 7. This model contains open-collector type NPN transistor which allows direct connection to Programmable Controller. 9. This series has Continuous, continuous with warning sound type according to operation methods. 10. For details information, please refer to selected guide. 11. Vibration Resistance:10~55HZ Frequency,0.5mm amplitude in Y direction for 40 minutes. 12. Shock resistance 500m/s acceleration(approx.50G)in Y direction for three times.